Has anyone had experience using doubleknit fabric for lap quilts? I have quite a bit of fabric and would like to find a good use. I made one with a scrappy dp9p and it turned out great...just used fleece on the back ad did a sid around the large 12" finished squares, wrapped the fleece to the front for binding and machine stiched it down. Double knits can make some of the longest lasting quilts. That fabric is almost indistructable! Just make sure you use simple patterns with out a lot of intersections as the seams get quite bulky. Do note they can also weigh much more than a cotton quilt.. I have a stack of them here. Not lap quilts, but full size bed quilts. I didn't make them, DH's mother and sister did. I like them cause they are alot warmer. They also launder up nice. These are tied not sttich quilted. I think it would be hard to stitch them. They are also handmade. I've used polyester double knit to make quilts for dogs ... not very fancy, but they are interesting and almost indestructible as they go through weekly washings. I also made one for a lady in a nursing home for the same reason (it was made from clothes that had hung in her closet), but don't know what happened to it after it walked away. As others say, keep the pattern simple. I tied some of them and then tried stitching simple designs where fabrics met in a couple. Easy and quick projects. Also use caution when pressing. I made a commission memory quilt once out clothes that had double knits and it was very easy to glaze the polyester knit with a hot iron. After I ruined one piece of patchwork I used a pressing cloth after that and it worked well. Can't say I liked working with them though. I love double knit quilts!!! Only problem is my sons likes them too and when they moved out over the years, they took them with them. They are just super warm. I didn't make them. A dear lady made them years ago. I still manage to keep two of them for me. I was lucky to find a KING size, dk quilt for $50. I snapped that up in a heart beat! My DH thought I was nuts because it is sooooooooooo heavy, but I love it! So yes I am a fan of double knit and never turn it down when it is offered. I plan to make some lap quilts for the nursing home this year. They make great dog beds. Also, wonderful clothes line bags. They are wear like iron!!! I use ANYTHING that is donated..... ANYTHING!! I have been covered with a lap quilt of double knit today.[sick]. I have many quilts for bed that my sister made from double knits. They are so warm and never wear out and very ,very washable. she tied them. some she made in long strips, that way she could have them machine quilted. Don't worry about using it for quilts. It is very good. I haven't made any yet but it is my thought to make some lap quilts out of polyester knits, assorted squares or little biscuits, and back with flannel or fleece so the would be less likely to slide for folks in nursing homes esp. in wheel chairs. I figured polyester would hold in a lot of heat and so many elderly people I know seem to feel cold a lot. My neighbor makes beautiful quilts for all her family. When she makes them for DGC going to college, they are made with double knits to withstand coin laundries! Years ago some friends and I made them for a local nursing homes. The laundry loved them because they were so sturdy. I wonder if any are still in use???? I think they were flannel backed. I have never made one, but when I first started doing longarm quilting, I was given a Trip Around the World quilt to do and I was super surprised how it turned out. It was polyester top and a brand new sheet for the back. I am sure the quilt shop owner gave it to me to do because no one else would take it on. I put out some freezer paper and took my Sharpie and drew a meandering design on it to follow like a pantograph. That way, I was able to just quilt and not worry about where the seams in the quilt were. The quilt shop owner, and her customer, loved the job and I was soooo proud of myself for being brave enough (or stupid enough) to do this project. Most of the ones I've seen done with double knits were fairly large squares of all different colors. And they were tied either at the corner intersections or in the center of the squares. Most did not have batting, only the matching squares of double knit on each side. I'm thinking the squares were about 8 or 9 inches. I have never used any but I woulld think it would be just fine. I've been given some dk tops to finish. I have finished a couple of them and they have been chosen by people--mostly older ladies. I happen to despise the stuff--I was too young to appreciate it but it was all around me when I was growing up (I'm 50). I know that it wears like iron, but i don't really even like touching it. However, it does make a warm quilt. The seams don't press sharply though and there won't be any winning designs. But on sheer durability and weight, they'd win any contest, I'd think. I've got two tops downstairs to finish. I will tie them and get them done as quickly as possible. If someone gives me dk fabric, however, I don't use it for making tops--I pass it on. I really don't like it, though I can appreciate it's qualities. Thanks for all the replies. I have been lucky enough to find several polyester doubleknits at flea markets. The one that I finished, I tied it together. I used a lightweight batting and sheet for the back. Yesterday, I visited a friend at a nursing home. She had made a quilt using doubleknit and it is very sturdy and warm. So, I think I will continue to purchase any tops that I find! thanks for all the wisdom from the quilting friends! here is a photo of flea market find that will be tied later. I can answer Irishrose's question...."I wonder if any of them are still in use? "......I have one lap robe(or wheel chair quilt) that was my grandmother's. I was used many years in a nursing home and I still have it! Sorry; it is stored and I have no pic. I have made polyester double knit quilts any time I've had double knit fabric. I give them to people in homeless shelters that have no heat at night. They are really warm and durable. I made one, a Broken Dishes pattern, on the serger, and a number of people wanted it. I've made others, and also backed cotton quilts with double knit, which I think then needs to be quilted rather than tied. I made and kept one king size double knit quilt, and it has been used on the couch, on the bed, and for camping trips daily for 18 years. A couple seams popped and I fixed them, but it's still going strong. 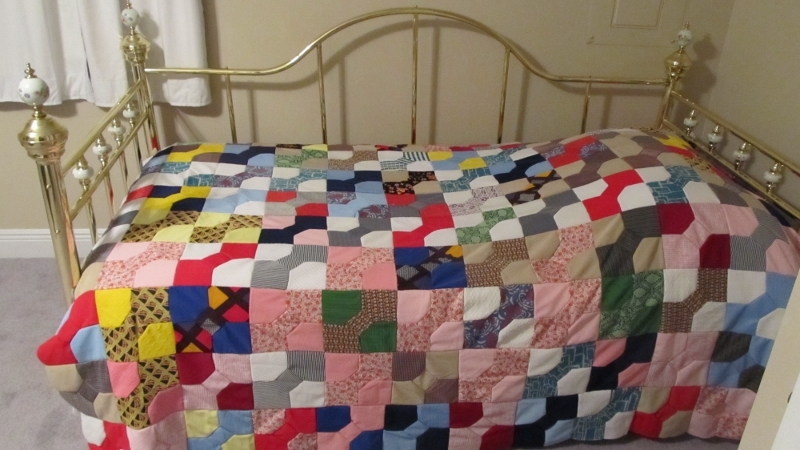 A 100 percent serged cotton quilt I made the same year has just been retired. I find that a Singer 401 handles these heavy quilts easily as well. One thing I did learn: use the same weight of double knit for all parts. A lighter weight will eventually tear.